Helmets and bags (including hand bags & laptop bags) shall not be permitted within the stadium. The Islanders are in town and the Blues are ready to take them on! Catch Sunil Chhetri and his Bengaluru FC team face Mumbai City FC at the Kanteerava Stadium, book your tickets now! This Match Ticket has been issued by the Company and is valid for one (1) person only, i.e. the Ticket Holder. Purchase and/or use of this Match Ticket is available only to persons who can form legally binding contracts under applicable law. Persons who are “incompetent to contract” within the meaning of the Indian Contract Act, 1872, including persons below the age of eighteen (18) years are not eligible to purchase or use this Match Ticket. However, a person below the age of eighteen (18) years may be permitted to enter the Stadium subject to: (a) her/him being accompanied by her/his legal guardian and is under direct supervision of such legal guardian at all times inside the Stadium; and (b) such legal guardian is holding a valid Match Ticket on her/his own behalf and another valid Match Ticket for such person who is above the age of five (5) years and below the age of eighteen (18) years. If a person is below the age of five (5) years, she/he will not be entitled to a separate seat unless such person’s legal guardian is holding a valid Match Ticket for such person as well. The Ticket Holder agrees that in the event she/he brings any person who is below the age of eighteen (18) years into the Stadium, she/he shall be liable for the safety of such person and the Company, the Club and their representatives shall not be held liable in any manner whatsoever for the safety of such person and such Ticket Holder shall indemnify the Company from any claims in this regard. The Company reserves the right to make alteration to the times, dates and venues of the Match or to substitute the seat or area to which this Match Ticket refers at its reasonable discretion. If the Match is cancelled or curtailed for any reason, there shall be no obligation on the Company to reschedule the Match. This Match Ticket must be produced whenever demanded by the, Company, the Club and /or their representatives or stewards. 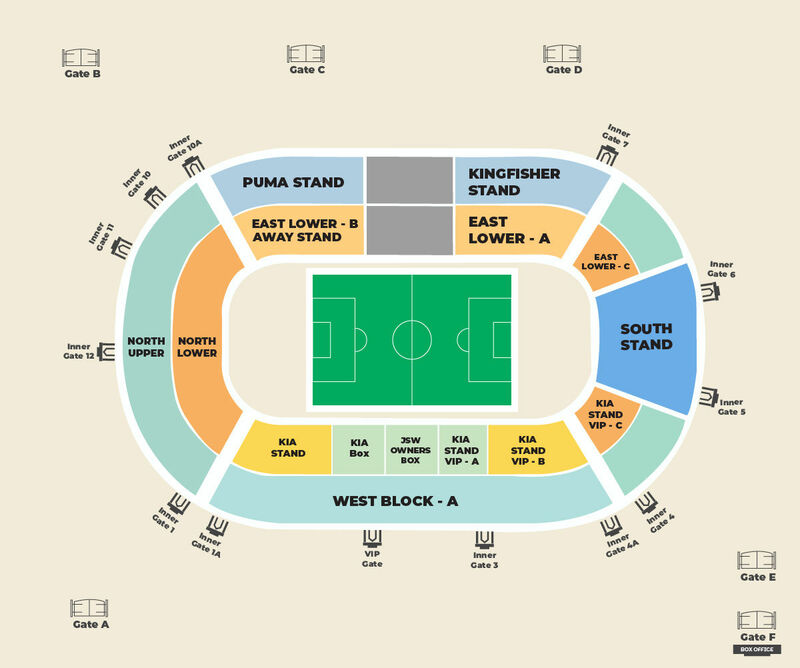 The Ticket Holder must comply with any reasonable instruction from an officer, steward or security officer at the Stadium. No alcohol may be brought into or taken out of the Stadium and no food may be brought into the Stadium. The consumption of alcohol may be permitted only in the authorised designated areas or places in the Stadium during hours determined by the Club, which reserves the right to close or restrict entry to any such authorised designated areas at any time. Alcohol will not be served to any Ticket Holder under the age of 21 years. The Company, its representatives and its sub-contractors have the right to ask the Ticket Holder to produce her/his government-issued photograph identity card (which has her/his date of birth on it) to show that she/he is 21 years old or older. Mobile telephones and cameras (non-DSLR) shall be permitted within the Stadium, provided that they are used for personal and private use only. The use of mobile phones, transistors, computers, cameras or any other audio-visual recording equipment, for recording and/or communication of Match details, text, statistics, images, results, commentary, etc. for any commercial purpose is strictly prohibited. The Ticket Holder is hereby advised that use of any of the language or the behaviour referred to in paragraph 24 above or any action in breach of paragraph 25 will result in ejection from the Stadium and possible further action such as criminal prosecution, identification by way of photographing and/or capturing by video camera of the images of such persons and life-bans for all the Club’s matches and matches at the Stadium being imposed on such persons. The Company does not guarantee that the team for the Match will necessarily only be selected from the Club’s regular first team players. The team manager may consider it desirable on occasions to omit regular first team players and select the team from the full playing squad. The Company will not, subject to any limitation imposed by law, be in any way liable to the Ticket Holder for any event, occurrence, or other thing the cause of which is beyond the reasonable control of the Company, including, without limitation the abandonment or postponement of the Match due to weather conditions or due to any direction received from the AIFF, FIFA or AFC. Ticket Holders shall however be entitled to attend any re-arranged/re-scheduled version of the Match at a later date at the Stadium. Further, the Ticket Holder acknowledges and agrees that she/he will be watching a sport at the Stadium and there is a possibility that she/he might get injured or hurt due to the sport being played at the Stadium. The right of admission to the Stadium using this Match Ticket is reserved at the reasonable discretion of the Company. The Company reserves the right, without refund or other recourse, to refuse admission to or eject from the Stadium the Ticket Holder, if the Ticket Holder is found to be in breach of these terms and conditions or otherwise misuses the Match Ticket. Any dispute or difference either in interpretation or otherwise, of any terms of these terms and conditions including but not limited to the Match Ticket, shall be referred to and finally resolved by arbitration under the Arbitration and Conciliation Act, 1996. The number of arbitrators shall be three (3): one (1) each nominated by the Ticket Holder and the Company and the third arbitrator chosen by the two (2) arbitrators so nominated. The above arbitration shall be conducted in English and the arbitration shall be held ifn Bengaluru, India.